Why is Jabari Not Being Allowed to #Blashtoff? When the San Diego Padres dealt Yonder Alonso and Marc Rzepczynski to the Oakland Athletics in early December, not only did they receive a great left-handed pitcher in Drew Pomeranz and a decent LHP prospect in Jose Torres, but the team also attained a player to be named later from the A’s. Jabari Blash was selected from the Seattle Mariners with the sixth pick and immediately shipped to the Padres to complete the Alonso deal. The lanky outfielder from the Virgin Islands has huge power potential. Blash hit 32 home runs last year in the Mariners minor league system. He did that while hitting .271 on the season and amassing an impressive .370 on base percentage. Blash has a contact issue though as he struck out 123 times in 406 at bats in 2015 between Double-A and Triple-A. The hole in his swing might not be easy to fix, but like with most power-hitters, teams will just live with the K’s if it the result is 40 plus homers on the season. The walks and possible high on base percentage are just icing on the cake for the Padres. Blash has all he ability in the world but he is by no means a sure thing. He has worked his tail off in the minors, but it took him over five years to reach the major leagues.He is 26 right now and will be 27 in July. The Padres cannot afford to just let him sit on the bench. He needs to play at this level and we need to see if he can make the adjustments. Giving Blash at bats seems wont’ be easy. The Padres outfield is currently stacked. Matt Kemp is the teams superstar and will play almost every day. Jon Jay is the starting center fielder and one of the lone left-handed veteran bats in the lineup. He needs to play almost every day as well. That leaves left field where Melvin Upton Jr. is picking up right where he left off last season. He is really driving the ball to all fields and looks like a changed hitter in the batter’s box. That leaves Jabari Bash the odd man out. Factor in Travis Jankowski to this equation too as the speedy lead-off hitter has been getting playing time as well. In reality Blash is the Padres #5 outfielder. The Padres are also stacked in the outfield position in the upper minor league levels. Hunter Renfroe, Alex Dickerson and Manuel Margot are all very close to being ready for major league service time. Dickerson played sparingly late last season going two for eight in September. The left-handed stick can play first base too and has the ability to be a decent major league player. All he has done so far in his minor league career is hit. He has a .300 career minor league average with a .368 on base percentage in 2,000 at bats. Sadly Dickerson is buried behind the Padres depth at the position and will likely never be given an opportunity to play everyday for the Padres. Renfroe and Margot are two of the prized jewels of the Padres farm system. Both WILL be given every opportunity to play. 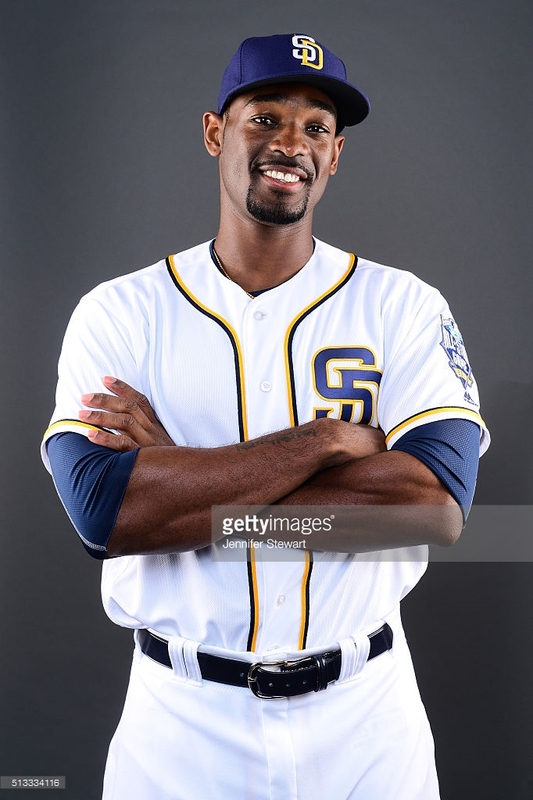 With Upton, Kemp, Janowksi and Jay already in the majors and Renfroe, Dickerson and Magot knocking on the door, where does that leave Jabari Blash? The fan base is in love with Blash. I am not quite sure why either. He has tons of power and is exciting to watch but those K’s are of serious concern. Factor in he has no place to play and the Padres are making an odd move in keeping him on their roster. If someone is dealt and Jabari can play then it makes sense. To have a 27-year-old sit on the bench for most of the year only to try to stash him away for next season seems silly. Especially when in 2017, Margot and Renfroe will be one more year advanced in their baseball abilities. Blash is 2-15 with eight strikeouts right now. He was productive on Tuesday when he walked after a 12-pitch at bat. He laid off a few tough pitches down and away and fouled off some inside stuff as well. He battles up there and you can plainly see why he draws a lot of walks for a power hitter. Blash has a lot of ability, but do the Padres have a plan that includes Blash with consistent at bats? Jabari Blash needs to play. Nobody questions his power or ability, but those traits do not dictate a potential major leaguer. He needs to make advancements in his development and that can only be accomplished with him in the batter’s box. The Padres are in a tough spot right now. Blash needs at bats, but none of the three veteran outfielders can come out of the lineup. It could be a frustrating year for Jabari Blash and his fans.